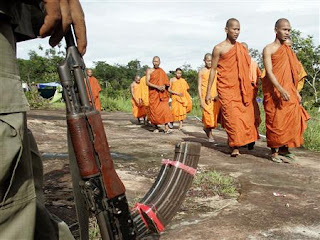 Five years after a row over the famed Angkor Wat temples turned violent, the ownership of another religious site is again inflaming passions in Thailand and Cambodia. A volatile mix of politics and nationalism swirling around the Preah Vihear temple, perched on a disputed border where troops faced off for a sixth day on Sunday, has raised fears it may turn ugly, as in 2003 when a nationalist mob torched the Thai embassy in Phnom Penh. 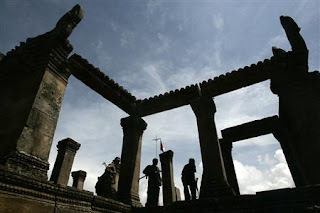 The trigger for the latest temple tantrum was Preah Vihear's listing as a World Heritage site this month, a move that inspired pride and joy in Cambodia and a political uproar in Thailand. Groups opposed to the Bangkok government, which backs former Prime Minister Thaksin Shinawatra who was ousted in a 2006 coup, have cranked up nationalist fervor over the temple, which Thais know as Khao Pra Viharn, to attack the administration. "Preah Vihear has become a casualty of Thailand's political crisis," Thitinan Pongsudhirak, a foreign affairs lecturer at Chulalongkorn University. The 11th century Preah Vihear complex, sitting on a remote and heavily landmined escarpment separating the two countries, has been a source of tension for decades. Although easily accessible only from Thailand, it was bestowed on Cambodia in 1962 by the International Court of Justice in the Hague, a ruling which still rankles with Thais. "I have been crying since the listing of Khao Pra Viharn as a World Heritage site," said 49-year-old accountant Unchana Padungyat, who drove 600 km (370 miles) to join 2,000 Thai nationalists protesting near the temple. They are members of the People's Alliance for Democracy (PAD), a coalition of royalists, activists and businessmen leading a two-month street campaign against Prime Minister Samak Sundaravej, whom they say is a Thaksin proxy. "Our sacred mission is to protect our motherland and take back Thai territory," PAD leader and media firebrand Sondhi Limthongkul said on Friday, accusing the government of selling out Thailand's heritage. The PAD seized on the issue after Foreign Minister Noppadon Pattama, Thaksin's former lawyer, agreed to support Cambodia's bid to list the temple, arguing it would not affect Bangkok's claims to 4.6 sq km (1.8 sq mile) of disputed land around Preah Vihear. Noppadon was forced to resign after a court ruled he had violated the constitution. The PAD is now seeking a similar ruling against Samak's entire cabinet. Samak, who has slammed the PAD for inflaming tensions over Preah Vihear, has nevertheless engaged in a diplomatic war of words with Cambodian Prime Minister Hun Sen over the temple. Thitinan said Thai leaders cannot go too far against the nationalist tide, "or you would be accused of being a traitor". He said the troop build-up on both sides of the border appeared aimed at gaining leverage ahead of hastily arranged talks on Monday to find a peaceful way out of the dispute. "The talks are critical because if they turn out badly and nothing is agreed, we could see an escalation," he said. The temple stand-off has also dominated Cambodian politics ahead of a general election next Sunday, allowing politicians to avoid tackling "real issues" such as poverty, rights groups say. The Sam Rainsy Party, which denied Hun Sen a parliamentary majority in the 2003 poll, has demanded a tougher government response to the "Thai army invasion", including the immediate withdrawal of Cambodia's ambassador. Hun Sen has accused Bangkok of encroaching "on our territory" and also sent more troops, but the former Khmer Rouge commander's rhetoric has been restrained compared with five years ago. In the run-up to the 2003 polls, Hun Sen fanned anti-Thai flames after a Thai TV actress purportedly said she would not visit Cambodia until Angkor Wat was returned to Thailand. Hun Sen said she was "not even worth a blade of grass at Angkor". A few days later, mobs torched the Thai embassy and Thai businesses in Phnom Penh, severing relations for months. Now, Phnom Penh is working the diplomatic route, calling on the United Nations and regional neighbors to put pressure on Thailand, and downplaying fears of a major escalation if Monday's border talks fail. 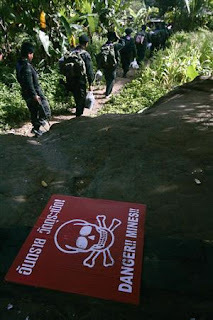 "Diplomatically and legally we have a winning case against Thailand. 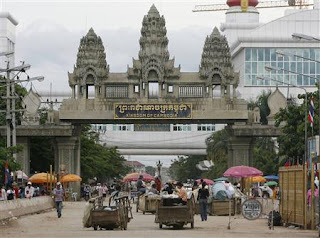 If the talks fail, we'll go to the international courts," Cambodian government spokesman Khieu Kanharith said.